This morning we are awaited at the EJE centre, a two-storey building that stands a few steps away from our "home sweet home" . Samaher, the young and (very!) pretty coordinator of the centre welcomes us in the central room, a large hall decorated with drawings and pictures of little boys and girls from Al-Arroub camp. We agree with her on different types of activities we could do with the children next week. She advises us to start with outdoor games – we tell her briefly about games we call in French “Lemon Lemon”, “the Conductor”, “the Enchanter “ - in fact, games we play (or used to play) at home with the scouts. Samaher thinks the children will enjoy them. Then Margot, who thought about it well before we left to Palestine (she is such a pearl! ), tells everybody about a do-it-yourself workshop she has imagined : helping the children to make each for themselves some sort of “happiness notebook", actually, a small customized notebook in which the children will draw things they like or that make them happy: objects, people, animals, landscapes, celebrations, whatever. When they feel down or sad, they can open it and, hopefully, feel a bit better when they remember that there is something else than the quarrels at school, the soldiers in and around the camp, the nightmares at night... Samaher nods her approval, this can only do the children good. 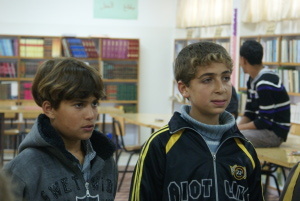 We say good-bye to Samaher and follow Tareq to the school where he teaches: the UNRWA Boys’ School. The headmaster receives us in his office, a long narrow room that opens on the playground. He is still busy for two or three more minutes. We tell him it is Ok, he shouldn’t worry for us. On the walls, there are yeargroup pictures and, of course, aview of Jerusalem with the shining gilded cupola of the Dome of the Rock in the middle. The Palestinians of the West Bank don’t have the right to go to Jerusalem. But nobody can’t prevent them from thinking about it and loving it from far. This room is where the teachers come to have a glass of tea during the breaks or, as is the case now, at the end of their day’s work. They smile back at us and kindly offer us their seats. They can’t hide their surprise at our being here. We are not old enough to be international officials : who are we then? What are we here for?... Sandra told us that it was not commonplace for the inhabitants of Al-Arroub to have groups of visitors of our age. The headmaster is about to conclude the discussion he has with a lady, most probably a pupil’s mother. While waiting for him, we watch the comings and goings of the children in and out of the school buildings. They invade the UNRWA white-and-blue playground, chase one another, their satchel on their back: school is over, they are going back home. How to integrate human rights to the subject taught?... We look at each other, nodding appreciatively (we can’t pride ourselves on doing that in Belgium!). And also, we remember the press conference we attended in Jerusalem, just before we left: the Israelis accuse the Palestinian curriculum of provocation, justifying thus the Israeli government’ decision to replace it with the Israeli curriculum in all the Palestinian schools of Jerusalem. “False”, one of the speakers had said, “we teach peace to the children we are in charge of”... Obviously, this applies in the UNRWA schools of the camps too. The headmaster goes on: “The characteristic of all the UNRWA schools is their denominational neutrality, the only way to ensure that they are safe places for the children (state schools, on the other hand, are under the control of the Palestinian Authority and have a religious character.) The teachers are paid by the UN, which are also responsible for the functioning of the schools. The latter also receive financial help from different NGO, thanks to which additional sport or artistic activities can be organised (competitions, dance or theatre festivals, PE shows). Every year, some European and North-American NGO take charge of a limited number of pupils and students (20 out of 600, that’s not much, the headmaster comments), so as to offer them a little change and the opportunity to do some self-development work or to do their hobby, etc." "There are no playgrounds for the children inside the camps. There is only the street, with all its dangers. 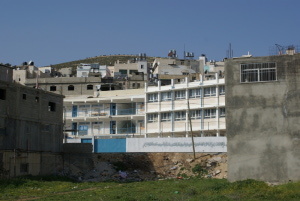 The main problem for the inhabitants of Al-Arroub is the much too frequent clashes there are between the children and the soldiers. The latter enter the camp when they feel like it, in a jeep or on foot, always in a group. The children’s reaction is immediate: they start throwing stones at them. The soldiers answer back with real bullets. The night following the incursion, the same soldiers come into the houses to arrest children, on the grounds that they threw stones at them. Yesterday, for example, they took three, one of whom was on his way to the mosque with his father for the Friday prayer... If the parents want to get their child back, they have to pay a 2000-shekel fine (about 400 euros): a fortune." We glance at Tareq, who confirms all this with a nod. Sandra told us about it on the day we arrived here, didn’t she?... How unreal our idyllic picnic in Mar Saba seems to us now: just imagine! If "our" young Palestinians had not come with us yesterday, where would they be now ? "The children of the camp are psychologically damaged. All of them have a member of their family who was arrested or killed, many of them have been arrested and taken to prison at least once in their school life. As I said to you, there are no playgroundsor sport ground in the camp where they could play safely after school. So they spend their time watching rubbish on television, or chasing each other in the street, screaming or arguing with each other. 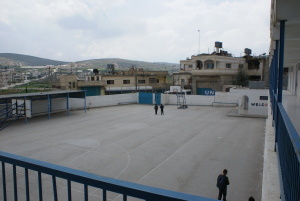 The only place where they can play safely is the school playground, which stays open every night: indeed, no one wearing a uniform or carrying an arm, be they Israeli or Palestinian, can enter a UNRWA school." We ask: don’t children have classes in the afternoon? The headmaster answers: "They have classes from Sunday to Thursday, from 7.30 a.m. to 2 p.m. Then, school finishes and the children go back home to do their homework or to play. In our school, there are only about twenty teachers to take care of all the children. But,"he adds, pointing at Tareq, "Tareq alone is worth five teachers!" We smile at Tareq, who blushes, lowers his head while making a sign to the headmaster: “Please, stop it! Let’s talk about something else! " “The teachers stick together. They also try to involve the people into the activities that are organized by the school. Theyhave helped setting up a parents’ board and a students’ board... Yes, the children are difficult... There are three teachers on each floor who are there around the clock to watch that no child goes through the window. But after 2 pm, there are no adults anymore to kep an eye on the children… Consequently, in the morning, it is not rare to find broken window-panes, all the more as it is not only the children of the school who come and meet here…"
"The school and the EJE cultural centre try to set up activities for the young ones. We invite counselors, social workers, psychologists to speak with the children, help them express their aggressiveness, their fears. But, some children are really difficult: they destroy the school furniture and equipment. I admit that I often feel powerless. I have the feeling that what I do here is pointless… Before I came here, I used to work in a school around Jericho. It was closer to the wall, but the children I was in charge of were a lot more smiling, also more motivated by school. Here, they are much more frustrated, more violent." "What the children here like most is going on a school trip, going out of the school, out of the camp. Last year, we organized a little journey to Jerusalem, which is 30 km away. This was a big first: most of the Palestinians of the West Bank have never set foot in Jerusalem. They are not allowed to. The children were jumping for joy at the idea of leaving! Not a day passed without them speaking about it…"
We are discreetly interrupted by a man who beckons to the headmaster from the door of the office : he is needed. We all stand up, thank him for the time he has given us and follow Tareq up to the first floor of the building: we are now going to attend a song and dabkeh workshop. .
As they enter the classroom where the workshop is about to begin, Tanguy and Anne-Claire just can’t believe their eyes: one of the workshop leaders is none other than Ribal! Ribal, the 19-year-old man who made such an impression on them in 2009. One of the few who, as they will learn afterward, is still working at Al-Rowwad Centre in Aïda . Indeed, many of the people they met with the Taayoush group have distanced themselves from Al-Rowwad Centre. As Sandra and Martine will explained later, the Palestinian society is still terribly clan-like and, little by little, there were only members of the director’s family left to run or participate in the different activities of the centre: too bad for the others. But Ribal stayed. It must be said that he is sort of "the" success of the Al-Rowwad project: he joined the theatre company when he was just a kid, climbed up the ladder, became a workshop leader and a coordinator. What’s more (Sandra told us discreetly), when his father died last year, the director of A-Rowwad really supported him during the difficult times he had to go through: being the elder in family, Ribal is now in charge of his mum and of his little brothers. Anne-claire and Tanguy are shocked and disappointed to hear what Al-Rowwad has turned into: the director’s great speeches seemed to indicate something else than that. But would we have acted otherwise? Not sure. And why should the Palestinians be better thanmost od the people? In the meantime, the children who participate in the workshop have all arrived. In the workshops, in fact, for there are indeed two taking place at the same time: some of the children form a small choir and practise singing together with a music teacher who accompanies them on the keyboard, while the others work at their dabkeh steps with Ribal. There are six singers, all boys aged 10 to 12. One is dark-skinned, two are fair-haired with clear eyes. This surprises us: they don’t correspond to the idea of an Arab we usually have in Europe. When they sing, they do so with all their heart. They stand well upright, in semi-circle, in front of their teacher, whom they don’t let out of their sight while he’s playing the keyboard or marking the rhythm on a tambourin. 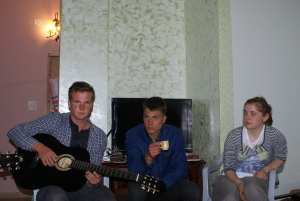 One of the children sings some lines solo, than the others fall in behind him. When the song is over, they sit down and watch the other half of the group work their steps with Ribal: six dancers too, in jeans and sweat jackets. They hold each other by the shoulders, thus forming a line that moves according to the tempo given by Ribal, who counts: “wahid, thniin, thalath, arba, wahid, thniin, thalath, arba, wahid, thniin, thalath, arba”. They must be in harmony with rhythm of the music coming from the tape-recorder, cross their legs, jump, move back, then forward, jump again, all as one… Ribal makes them do it again and again. It is the singers’turn again: sounds of cimbalon, flute and tambourin. Here and there, we recognize the word “filistiin”, Palestine, which they sing with obvious pleasure and pride. We give them a big round of applause : their voices are just as great as those of “Les Petits Chanteurs à la Croix de Bois” at home: same purity, same grace. Their teacher sometimes stops them and sings for them, explains to them how he is doing it. They listen to him very carefully then imitate him on the melodic line only, then once it is clear for them, again, with the instrumental arrangement. We wouldn’t be able to do so, that’s clear! The workshop lasts one hour and a half. After that, we go back to the EJE centre where Nidal, the director, is waiting for us. He welcomes us in his tiny office and explains to us that this centre is part of a whole "Children, Games and Education"-network: there are other similar centres in Jericho, Tulkarem, Shu’fat (close to the checkpoint we crossed with Daoud), in Ramallah, Gaza … Nidal supervises the work that is done in the different centres of the south of the West Bank. "The first trip the children of the camp were able to do was an excursion to the seaside, which was organised by volunteer of the French Catholic Relief. The children had dreamt about it for weeks beforehand. We had put a map on the wall and drawn the itinerary that they would follow to get to the sea. Of course, we had difficulties getting the travel permits from the Israeli authorities… Last year, eight children who play soccer were able to cross the border, go to the airport, take the plane. It was the first time they were going to France and playing against international teams from Brazil, Soudan, …"
"Stéphane Hessel is one of the main founders of EJE. We regularly receive foreign delegations from France, Egypt, the USA, England, Greece, Italy... Last year, we even had a group of volunteers from Louvain, in Belgium. People come to see us and to inquire about what we need." “It is the schools that send us the children, all of the "difficult" cases for whom we provide feedbacks. We try to help these children express their problems through artistic and play activities. Our social workers meet about seventy families a year, people who are in deep pain." We listen carefully to this man. Everything Nidal says corroborates what the headmaster of Tareq’s school and what Sandra have told us on the subject. We slowly begin to make a clear idea of the extent of the problem. "Now, you must know that more than 75% of the Palestinians go to High School or University : it is the highest percentage in all Arab countries. The explanation is simple: the people lost everything during the 1948 Naqba (= “catastrophe”) so now they invest in their children’s education. And, indeed, the children usually encounter few school problems during their studies. Droupouts are only 1%." "We have set up programs to help the children of the camp to grow up. It is important for us to teach them tolerance, that they learn to accept the other one and develop another attitude than hatred. We teach them that it is better to fight with words, say "this is also my country! ", rather than resort to violence. We don’t encourage a culture of hatred. You will never hear a word of hatred here. This centre was created away from politics, for the children, so they can escape the street and the soldiers’ brutality." These words: the same speech as the one the 2009 Taayoush Group heard in Silwan, Aida, Hebron and Nablus. The same as the one we heard at the press conference in Jerusalem : "We don’t encourage a culture of hate". These are not only words. This is exactly what emanates from all the people we have met since our arrival in Palestine. Nidal suggests we should now watch two short films shot by young boys who participated in the media workshop of the centre. The first one, "The Gates", is both funny and tragic: we follow a young Palestinian on his journeys to his school, journeys of variable lengths according to whether the Israeli soldiers decide to open or not the gates of the refugee camps he lives in (in this case, Al-Arroub) and those of the town where his school is located (still in this case, Beit Ommar). There are moments in the film that make you smile, but the subject is grave: it is an illustration of how se riously occupation affects the children of the camps’ schooling. The second film, "The Trap" was shot by the young Malek Al-Sharef, whom Nidal was talking about a few minutes ago. This film was shown in Jerusalem, in France and in England. It tells the story of a pupil who is letting himself get dragged into collaborating with the Israeli occupation. This is not a fiction, Nidal says, but the sad reality of a lot of Palestinian children,who are forced to work as informers for the military officers and to denounce, for example, as is the case in Malek Al-Sharef’s film, the children who threw stones during a military incursion in the camp. Iin fact their own neighbours or school friends. This is not without a risk for them and for their families. The film shows us that the child is clearly a victim of the situation, but he will pay dearly the consequences of his acts. As Nidal explains to us, the "collaborator children" find themselves completely isolated afterwards: they are considered as "traitors" by their family and the whole community. Nidal tells us that the EJE centre organizes awareness sessions in an attempt to try to solve the problem and to lead the children to being careful, not to let the soldiers convince them to give names and betray their fellow-countrymen. “The camp has been rather quiet for a year now,” he confides to us, “but the soldiers are constantly looking for a fight. They yell at the children, provoke them until they react. Hence, the importance of keeping the children occupied as much as possible. The ideal thing about the centre is that it is located quite far from Road 6O, which makes it a safe place. You can be sure that this centre has, without any doubt, saved the life of several children. The fact is that, since 2008, when the activities started, there have been fewer brutal confrontations and more discussions." Nidal concludes his information telling us briefly about "Defence for Children international" (DCI), an organisation that takes care of the children who were raped, beaten or confined. He tells us briefly about the young Karam who was arrested in Hebron on his way back home from school. Another example among thousand others of what the children of occupied Palestine have to go through. We thank Nidal for the time he spent with us and go back "home", quite shattered by what we have heard and seen... Some of us reach for their guitar and strum it thoughtfully, some others go and lie on their mattress for a while, while the rest sets out preparing supper. Anything will do that can help empty our mind. Anne-Claire asks if anybody is interested in accompanying her: she thinks it is time to climb to the first floor of the house and pay a visit to Youssef’s mother, who owns our flat. Marie-Gaelle and Caroline follow her. The three of them climb up the outside stairs that lead to a kind of security door with wire fencing on its window. Youssef opens the door. He’s happy to see us. Youssef has a round baby-like face and a lisp. Later, we will learn that, indeed, he has a nervous problem, a consequence of the blows he got during a military raid. He shows us into the "sitting room", an almost bare place. On the ground, there a few rugs. On the rugs, alongside the walls, thin foam rubber matresses. Sitting on one of them is Noah, Youssef’s younger brother, the one who should have got married and should be living in the flat downstairs. He gets up, greets us kindly then goes back to his computer – a crock, in fact: the screen is broken and Noah can get half of a picture only. Youssef is back with his mother. How old can this lady be? She looks old, a little plump and her face is wrinkled and wizeled. She smiles at us, as if we descended from Heaven, keep our hands in hers for a long time. We sit down on the matresses with her and listen to her. Anne-Claire and Marie-Gaëlle don’t understand a word of what she’s saying. There is no need to: smiles and gestures are. She purses her lips appreciatively at Marie-Gaelle and Anne-Claire’s beautiful fait hair, and at Caroline’s too, of course (but black is definitely less exotic here!). We tell her the same about her magnificent long dress: a toobla, the traditional Palestinian dress. Black fabric with red cross stitch embroideries on the bodice, all down the sides and on the borders of the long sleeves. Anne-Claire adds, as if it was necessary, "jamilah!". The old lady applauds: bravo, anti tatakallam alarabiah jayyidan! you can speak Arabic! Youssef tells us that they will come and visit us"at our place" tomorrow evening: his mum would like to cook a meal for us or bake cakes, it is up to us. Anne-Claire, who has a sweet tooth, votes in favour of the cakes. The old lady laughs: that is a deal! And she will come with all her dresses: we will be able to try them on if we feel like it and take pictures to show our friends and parents in Belgium! We get up to leave: smiles, hands pressed against one’s heart, strokes on the cheeks - this lady is really touching. Youssef takes us to the door. In his arms, he is carrying his young son who has just woken up. The little baby-boy has a disarming look and the hair of an angel. Marie-Gaelle immediately falls in love with him, he’s so cute. She tickles him, makes funny faces and makes him laugh, under the tender eye of his grandmother, father and uncle. As they are coming down to our flat, Anne-Claire suddenly has a revelation: this empty room upstairs… In fact, they have taken down everything they have to furnish "our" flat! All the mattresses and blankets: when they are piled up, they must serve as couches in their sitting-room! 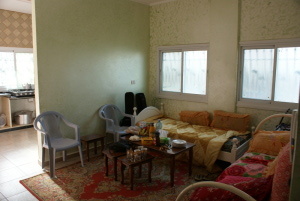 And the three little tables on which we have our meals, the TV and TV stand, the two beds we use as seats! Everything!... Wow! It is hardly believable but there is no other explanation !... If only we had realized earlier, we would have thanked them accordingly!... Such generosity! Above all: such discreet, behind-the-scene generosity… And so, in every corner of Palestine. more than 700,000 Palestinians have been to prison since 1967. Bassam has left. Apparently, the turn things have taken did not suit him anymore. Anne-claire questions Tareq : You all look so serious, she tells him, so responsible. From Wassim, who is only 15 to Hassan, who is 20. And you too. You have all such a strong political consciousness, you are all so anxious to act, to learn, get informed and inform the people about what happens in Palestine. With Bassam, it’s different, isn’t it? I have the feeling he doesn’t really care and only thinks of having fun, joking with the girls of the group, smoking his chicha. He is almost 30 though and has a wife and a child... Tell me, how can you be friends? Tareq smiles gently: "Yes, I know. Sarah always asks me this question too. It is true that Bassam is a little bit “majnoun”, a little bit crazy. He can even be really stupid sometimes. It is true too that he accepts things as they are and that the only thing he is interested in is having fun. He’s not the only Palestinian to react that way... It is a pity, of course... But at the same time, it does me good: I am all the time thinking and worrying. About Sarah, about Watan, about my students, my family, my friends. He makes me laugh... And I need that. But maybe one day, I won’t be able to stand him anymore." He says the last words with a gentle smile. Tareq makes us think of Daoud: the same wonderful sweetness, and the same great determination too. No wonder Anne-Claire has decided to consider them as her two Palestinian sons! “I am frightened to hear that children are jailed and that there is no special department for them in the prisons. But, it warms my heart to know about the huge solidarity there is among the Palestinians and that, inside the prisons, the older ones take care of the younger, organize classes or activities so that they don’t fall behind too much in their schooling." 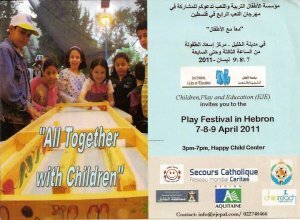 as a reminder : it is one of the cultutal centres of the « Les Enfants, le Jeu et l’Education » association. Have a look at dabkeh in Al-Arroub . 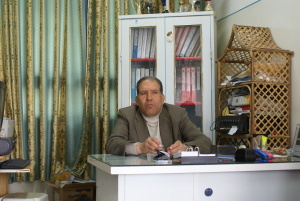 Read Ribal’s interview which we made in April 2009 in the refugee camp of Aida. See an example of a photo workshop filmed in 2010. Examples of work done by the media workshop : films produced in the context of the “Re-imagining project", a program of story-telling and media workshops run by "Voices Beyond Walls" in Al-Arroub in June/July 2010. On this subject, read the testimonies of former soldiers collected by the Israeli organisation Breaking the silence.